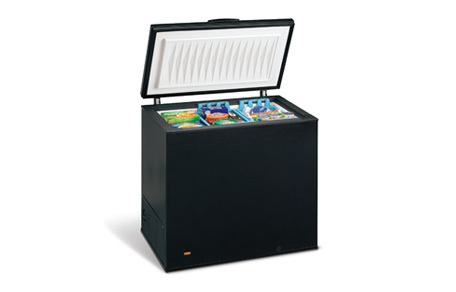 The capacities of small chest freezers range from 2.1 cu. ft. to 7.2 cu. ft.
Small living spaces are no longer an excuse not to stock up on sales, and for parties, holidays and surprise guests. So have your popsicles, burgers, meatballs and sausages ready to serve in a jiffy. These small chest freezers are ideal for singles, small families or those who have small living spaces such as apartments and RV homes. Or for those nifty places such as rec rooms, offices, garages and trailers. And owing to their size, they tend to double as cheap deep freezers so they are kind on your pocket, too. Here is the range of the leading small freezer chests on the market. They include an assortment of trusted brands such as Frigidaire, GE, Avanti, Danby, Igloo, Black & Decker and Haier. They are arranged by size, from the smallest to the largest. Compact dimensions (WxHxD) of approximately 37 in x 33.25 in x 22 in offer bulk frozen storage, and associated money and time savings but without the clutter. The shipping weight of 98 Lbs. makes it comparatively cheap to ship while a net weight of 91 Lbs. makes it easy to lift, and move around the house. A power indicator light assures you of the power status of your freezer with a quick glimpse. Two storage baskets help to compartmentalize your freezer chest and provide more room to store tiny food items. And these baskets can be slid around the unit or lifted out completely in order to create room for oddly shaped items. While this freezer needs to be manually defrosted periodically, a defrost drain makes it easy to channel the waste water for disposal and removes the need for heavy, backbreaking lifting. 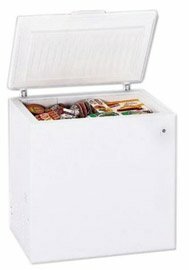 The small chest freezer comes with a limited 1-year warranty on labor and parts and 5 years warranty on the sealed system. So you can buy it in the assurance that defective parts and workmanship will be fixed without charge. The estimated yearly electricity consumption is 277 kWh which works out to an affordable annual electric bill of US$ 30 or only US$ 2.50 per month. This is 23% cheaper than some identically sized models. Owing to a textured aluminum cabinet liner, foam insulation in both the cabinet and lid, and wraps around the condenser and evaporator, this GE small chest freezer runs quietly and will not intrude on your home's serenity. Because it’s color is the traditional white, it won’t stand out of your home kitchen setting like a sore thumb. Like many of its counterparts, this is a no-frills small chest freezer. You should consider investing in it if you’re all for cutting out the unnecessary, expensive gloss and are just happy to have a freezer that keeps your food well-frozen. The Haier 7.1 cu. 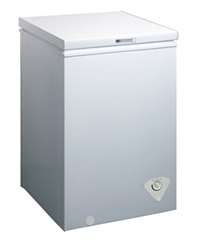 ft. chest freezer (Model # HCM071AW) is one of the small deep freezers available today. Even though the model is new on the market, it is quickly displacing similarly sized competitors as the consumer’s small freezer of choice. Compact dimensions (WxHxL) of approximately 37 in x 33.25 in x 22.06 in offer substantial frozen storage that can accommodate 294 Lbs. of food. This, in turn, offers countless opportunities to save time and money by making bulk purchases and cooking once a week or even month. The flat back design and integrated handle are great space savers so investing in this small chest freezer will help you keep your home looking spacious and airy and free of obstructing safety hazards. A shipping weight of 99.2 Lbs. means that the unit alone weighs much less and that it is therefore easy to move around the house. A power indicator light quickly alerts you to whether the freezer is receiving power, enabling you to take timely remedial measures. The thermostat dial gives you the power to regulate the temperature of your food. Plus, because it front mounted, it can be conveniently accessed without too much pulling, turning and heavy lifting. The wire basket is an ingenious way to store frequently used items that you will need to quickly access. There is no more need to suffer frost bite digging up tiny items from the bottom of the freezer either. A defrost drain makes periodically defrosting the freezer less of a hassle, as it eliminates the need to clean up messy water pools. The 12 month warranty on parts and labor, and 5 years warranty on the sealed system give you peace of mind that defective parts and workmanship will be remedied free of charge. The 7.1 cu. ft. Haier model is one of the cheap chest freezers on a cu. ft. by cu. ft. basis. Plus, it is a great choice for you if you find the 5.0 cu. ft. models a tad too small. It has a black cabinet, making it a great alternative for those who are looking for a non-white, small chest freezer to match their dark décor. As this little chest freezer has dimensions (WxHxD) of approximately 35 in x 34.25 in x 23.25 in, it is an incredible space saver. The freezer weighs 110 Lbs., making it light enough to relocate around the kitchen or even the house as often as needed. The internal dimensions (WxHxD) of approximately 30 in x 28.75 in x16.5 in of this black freezer provide ample storage for your favorite foods. A power on indicator light will let you know, at a glance, that your freezer is receiving power and that your hundreds of dollars of food investment are safe. The mechanical temperature control is conveniently located on the bottom left side of the cabinet exterior and lets you set and adjust the temperature of frozen items as needed. The temperature band is itself fairly broad and ranges from -10 to 10°F. The proprietary Store-more storage baskets are a great place to store tiny items or those that are frequently used. And, these baskets can be conveniently lifted out in order to create room for bulky items. The defrost drain takes the tedium out of the defrosting exercise as it helps to channel the waste water simply by tilting the freezer. As such, it eliminates the need for backbreaking lifting. Its annual energy consumption is 279 kWh, which translates to an electric bill of about US$ 30 or only US$ 2.50 each month. This small deep freezer is designed, built, and engineered in the US. So, buying this product will help you to directly support the American economy and pull it out of the throes of recession faster. 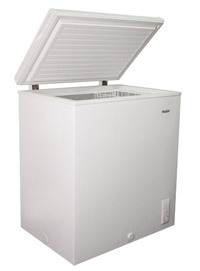 This is the largest of the small chest freezers reviewed on this page. Investing in it is certain to pay for itself quickly through saving money and time shopping more, less frequently.